Vitamin E oil is one of the most effective remedies when it comes to treating hangnails. Vitamin E, a powerful antioxidant, helps in softening and moisturizing the affected area. Take 1 capsule of vitamin E and pierce it to extract the oil out of it. Apply the oil on the affected area and leave it to get absorbed for some time. Reapply the oil several times a day for few days. 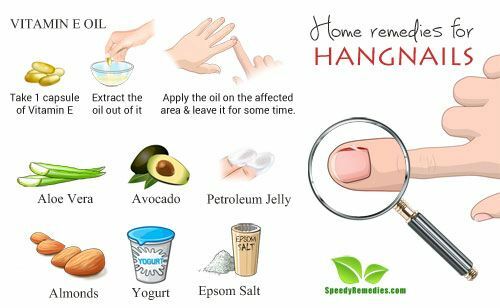 You can even mix vitamin E oil with olive oil or castor oil and apply it on your hangnail. Put a few drops of vitamin E oil after clipping your nails. This will help prevent hangnails. Aloe vera is known for its anti-inflammatory properties. Aloe vera moisturizes damaged skin; its antibiotic properties help reduce pain and clear up swollen infections. Take 1 teaspoon of aloe vera gel from one leaf of aloe vera. Mix little turmeric powder with the gel. Apply the mixture on your hangnail. Leave it for a minimum of 30 minutes and then, wash it off. Repeat the process regularly for few days. Alternatively, take fresh aloe vera gel from one aloe vera leaf. Apply it on your hangnail and leave it overnight. Use it on a regular basis for desired results. Avocado is full of healthy fats, natural oils like vitamin E oil that helps combat skin dryness. Take a small amount of avocado flesh and mash it. Mix it with 2 tablespoons of extra virgin olive oil or coconut oil. Repeat this daily for a month to effectively get rid of hangnails. Almonds are one of the best sources of vitamin E. The fatty acids in almonds help soothe and heal hangnails. Take a handful of almonds and soak it in water overnight. The next morning take it out of the water and peel it. Mix one beaten egg yolk and a little honey to the paste. You can even use milk or rose water. Apply the paste to the affected area before going to bed. Cover it with cotton gloves. Leave it overnight. Rinse it with lukewarm water in the morning. 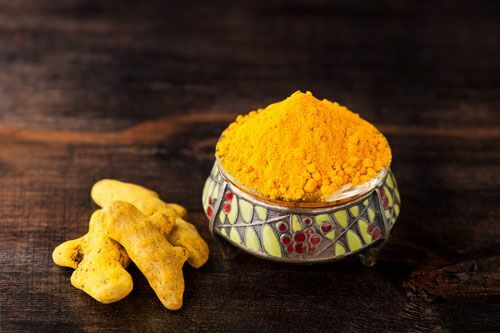 Turmeric is one of the powerful anti-oxidant containing analgesic, antiviral, anti-inflammatory, anti-bacterial, and anti-microbial properties. It has powerful healing powers and so can help prevent your hangnail from infecting your skin. Take a few drops of mustard oil and mix some turmeric powder in it. Apply it on the affected area and leave it for about an hour or you can leave it overnight by covering it with a bandage. Yogurt contains probiotics that possess anti-inflammatory properties. It can speed up the healing process and helps soothe your painful skin. Apply some yogurt on the affected area. Leave it sit for an hour. The antibacterial properties of Epsom salt are highly effective when it comes to healing your infected hangnail. It reduces swelling and inflammation. Mix 1 teaspoon of Epsom salt into a bowl of warm water. Soak the infected hangnail in the water for 20 minutes. Do this regularly for few days. Hangnails essentially happen due to dryness. So, to combat that problem, the moisturizing properties of petroleum jelly can come to your rescue. Mix 1 teaspoon of petroleum jelly with ½ teaspoon of sesame oil. Rub the mixture on the affected area before going to bed. Here are some tips to avoid hangnails. Keep your nail beds moisturized. Don’t pick at your cuticles. Push back your cuticles often with an orange stick or cuticle tool. Fight the urge to chew or bite your nails. Doing this causes your hangnails to bleed.